1. The closest airport is Shenzhen Bao’an International Airport. Transportation options from the airport are listed here. It’s about 40 minutes’ drive from the airport to the venue hotel ( show to the driver: “请带我去南山区明华国际会议中心；TEL：0755-26689968 ”). NOTE： Donot take Green Taxies; Use Red taxies and light Blue SUV Taxies for going to the hotel. Take subway Line 11(Airport Line) at Airport Station, transfer to Line 2(Shekou Line) at Houhai Station and get off at Sea World Station. 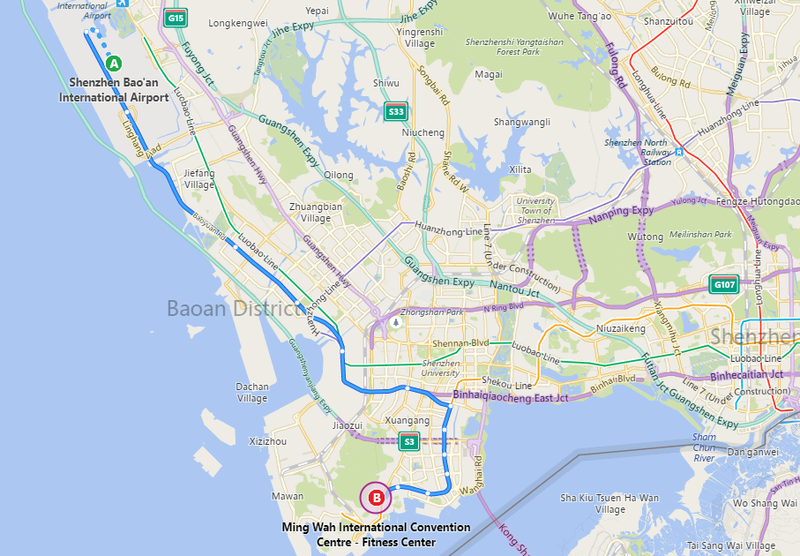 Then walk (about 10 minutes) to Ming Wah International Convention Centre. 2. If you arrive by plane in Hong Kong International Airport (HKIA), you can take a ferry from HKIA to Shenzhen Shekou (220HKD; You don’t need to go through HK Immigration ) or take a bus to Shenzhen Bay Port/Huanggang Port(around 150 HKD; You need to go through HK Immigration). Then you can take a taxi to the hotel.